Plant turnarounds, start-ups and maintenance activities need nitrogen over a wide range of pressures, flow rates and even gas temperatures. Emergency and spot nitrogen supplies can help you shorten costly turnarounds and avoid losses from having to suspend operations due to the shutdown of your primary gas sources. It can also help you maximize profits by supplementing your own gas supplies to boost production during periods of peak demand. WestAir can provide your entire nitrogen requirements, or supplement your onsite gas source. You can look to WestAir to provide the best supply options ranging from compressed gas in tube trailers, to bulk liquid delivery via state-of the art mobile pumping units with storage, vaporization and compression systems. With its patented on-board high pressure, high performance pressure builder and vaporizer design, the WestAir mobile pumping trucks and tube trailers precisely manage the heat for optimum gas flow, while keeping the liquid cold for maximum hold-time during intermittent use. This lets you service applications with one dedicated asset ready to be refilled onsite without taking the application off line. The WestAir team and our fleet of trailers and pumps can support a wide range of pressures and flows to supply many applications with gas or liquid. 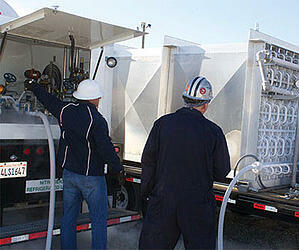 In addition, the trailers and pumps can easily be switched from service to service as needed. The WestAir mobile pumping trucks and tube trailers also provide a versatile solution for a wide range of temporary applications typically supported by gaseous high pressure tube trailers. No pads or permits are typically required for temporary applications. WestAir is fully-insured and has the team certified in the safety programs to needed to work in industrial plant and field operations. WestAir provides the 24/7 services to make operations run smoothly, on schedule, and on budget. Safety is our number priority. 48 hours lead time or less. We can go anywhere, at any time. Fastest mobilization time in the industry. We can quickly mobilize to meet your planned or unplanned nitrogen pumping needs. Application engineering know-how of safe and effective industrial gas use. Custom engineered services to develop storage, vaporization and delivery systems tailored to match the flow rate, pressure and duration of your nitrogen requirements. Experienced in low noise situations such as residential areas. Fill-times as quick as 30 minutes. Real-time data available performance sensitive applications like Cavern Integrity testing. Completely logged operation, recorded per second. You can count on WestAir to provide nitrogen pumping services to support a wide range of industrial plant, pipeline, well completion, and simulation applications. 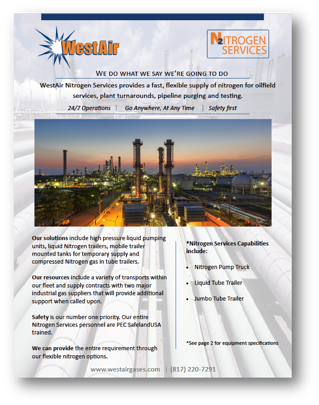 If you need nitrogen gases or pumping services help with a plant turnaround, start-up or maintenance, contact WestAir today at (866) 937-8247.